Politico.com says that the White House is actively seeking a replacement for Attorney General Alberto Gonzalez. 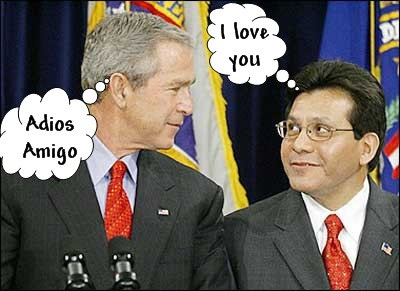 The names being floated are all Bush toadies who have shown a stronger loyalty to George W. Bush than to the country and the Constitution. Michael Chertoff? How does failing as Homeland Security Director qualify someone to be AG? Fran Townsend? A right-wing fembot as AG? Ted Olsen? Qualified -- yes. Appropriate -- no. The man is one of the creepiest of creepy right-wingers. If any Democrat voted for his approval, I would personally give money to that Democrat's opponent in their next election. Hello W -- look at someone NOT in your administration already. You all are tainted. No one trusts or believes anything you have to say. I'm surprised Harriet Meyers name has not been floated. He can fire Gonzalez, but like you said, his whole admin is tainted. Won't make a damn bit of difference. You know he's only going to pick someone who does what he and Cheney say, regardless. True. Everyone I know hated John Ashcroft. But who could have known that Ashcroft would actually be a better and more honest AG than Gonzalez? Not that I'd want him back, but sheeesh. Where do they find these creeps? If the Senate weren't basically 50/50 right now, I'd bet on Lindsey Graham over Lieberman. Graham could easily be replaced with another Repub, but it would be trickier in CT. All conjecture, obviously.